Back in 1993, four collegial, forward-looking men named Charlie, Guy, Nicholas and A. Donald got together with their fountain pens and signed a document called the LARC Covenant. These four- Charlie, Guy, Nicholas and A. Donald -were leaders, at the time, of the judicatories in Central Pennsylvania in the Roman Catholic, Anglican (Episcopal) and Lutheran traditions. Thus, LARC. More exactly (and to honor them with due respect) their names were/are: Charlie F. McNutt (The Episcopal Diocese of Central Pennsylvania), Guy S. Edmiston, Jr. (Lower Susquehanna Synod, ELCA), Nicholas C. Dattilo, (The Roman Catholic Diocese of Harrisburg), and A. Donald Main, (The Upper Susquehanna ELCA). 10.Work whenever possible to support and facilitate future ecumenical efforts among all Christians. Well. This is all good and fine. Very fine, in fact. 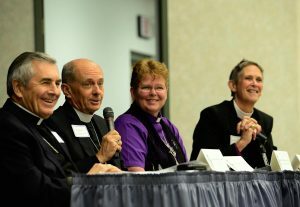 When I arrived in Central Pennsylvania two years ago, I learned about the LARC group and was introduced to the LARC Day of Dialogue, a symposium held annually in Harrisburg with speakers on different topics of ecumenical interest. My first year, 2015, we had a speaker from Virginia Seminary, The Rev. Dr. Robert Heaney, who spoke to us on the Mission of God in an intercultural and interreligious world. Last year, we learned about Laudato Sí (“Praise be to You”) the 2015 papal encyclical of Pope Francis with the subtitle of “On Care for Our Common Home.” And this year we enjoyed Bishop Emeritus Donald J. McCoid, of the ELCA who spoke to us with a historical view of Lutheran-Catholic dialogue in the past 50 years. The night before this year’s LARC day of Dialogue, we all gathered at the United Lutheran Seminary at the Gettysburg Campus Chapel for the Lutheran-Anglican-Roman Catholic (LARC) Vespers to commemorate the 500th anniversary of the beginning of the Protestant Reformation. At that Vespers service, we four colleagues, James Dunlop (Lower Susquehanna Synod), Barbara Jean Collins (Upper Susquehanna Synod), Ronald Gainer (Roman Catholic Diocese of Harrisburg) and I got our fountain pens out and re-committed ourselves to the LARC covenant. All 10 points. I’m curious what this will mean for us, operationally. I like to think that I am a person of integrity who actually does what I say I’m going to do. It is a little unnerving to sign a pledge, a covenant in front of people because I believe it actually means something. The three other times I’ve done that (my three ordinations) it meant a lot to me. And so- how will we step, together, into practicing the 10 initiatives of the LARC Covenant? If you’ve heard me speak on ecumenical matters, you know that I believe that we are headed for a post-denominational era in which our identification as Christians who follow Jesus will be of primary importance to us as we participate, shoulder to shoulder in God’s mission. Yes, I love my Anglican worship. And ethos. And approach to Scripture. And sacraments. AND, I believe that there is more that unites us than separates us, and that we can join together to strengthen our witness to Jesus and the Good News by working together. For many of our rural congregations it makes more sense to work with ecumenical and interfaith partners than it does to travel 10, 15 or 20 miles down the road to the next Episcopal church. I have talked with some of our smaller churches about the idea of forming a Community Church where various traditions are honored and strength is found in diversity of thought and practice as we are bound together in service. The LARC Covenant respects and retains the integrity of each tradition while commending us to share together God’s Word, the work of social justice, and to learn about each other. 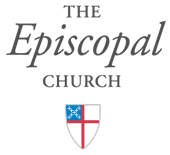 In my travels this year, I will be inquiring with our Episcopal Congregations here in Central PA about their participation LARC events. I’d like to learn about how the almost 25-year old covenant is serving us and how we can build support for its good initiatives. I’d like to learn, too, about ecumenical events outside of the LARC structure (Presbyterian, Methodist, UCC, Quaker, Mennonite, etc. partnerships) and who is working in the interfaith arena. I suspect that there is vitality in this good work, and I’d like to hear about it. absolutely! When I gather with those from other denominations I discover the gifts that their traditions can give us in finding new ways to access the Spirit.